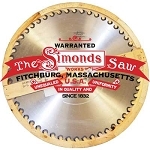 52" "F" Style 48 Tooth 6/8 Ga. Simonds Int. 56" "F" Style 52 Tooth 6/8 Ga. Simonds Int. 54" "F" Style 50 Tooth 6/8 Ga. Simonds Int.